Every candidate seeking office should have a plan to address the fact that renters in Illinois must earn more than $20 per hour to afford a two-bedroom apartment. In order to afford a modest two-bedroom apartment in Illinois, renters need to earn $20.34per hour. This means that to afford a two-bedroom home without paying more than 30% of their income on housing costs, a person earning our state minimum wage ($8.25 per hour) must work 99 hours per week just to make ends meet. 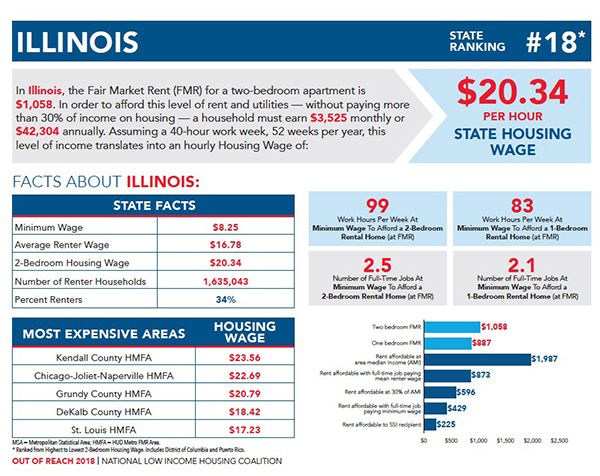 This Housing Wage is shared in Out of Reach 2018, a national report co-released today in Illinois by Housing Action Illinois and the National Low Income Housing Coalition.